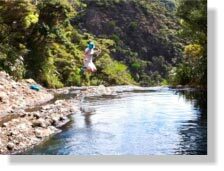 If you want to see the real New Zealand and have lots of fun doing it, then you need to come out with us. Absolute Tours specially designed, privately guided tours, avoid the crowds and take you even closer to nature for a truly intimate and authentic encounter. Our_small_guided_sightseeing tour groups go further and do more. Our guided tours of Auckland and New Zealand are not sit on the bus and watch it go by, they are more about getting out seeing it, touching it and doing it. Whether you’re visiting New Zealand or Auckland for a half day or have several days to see the country, our guided sightseeing adventures have something to offer everyone. Our popular Auckland City Tour offers a quick enjoyable look at our home town. Enjoy the wonderful Waitemata Harbour and waterfront, drive past Mission Bay to a wonderful look out and walk the “plank”. From there you will pass through Parnell and Newmarket and up to Mt Eden, Auckland’s best volcano with views over the whole of Auckland City. Travel back down to the waterfront to see the Harbour Bridge. Then view the boats at Westhaven marina and the new open area Wynyard Quarter. It really is a wonderful city to live in. Auckland City Tour is a must see before you head out on our most popular Day Tour to Piha Beach. 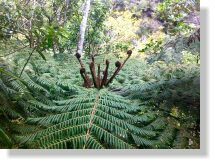 This walking tour takes in lush green rain forest in the Waitakere Ranges with breathtaking views of giant Kauri trees, including the silver fern. Visit the world famous Piha Beach on the wild west coast with black sand, awesome waves and the cleanest waterfalls and rock pools you will ever see. See the start of the Hillary Trail and get a taste of walking on it. If you have a special tour in mind contact us, Absolute Tours and we will customise the perfect tour for you that you will remember for a lifetime. 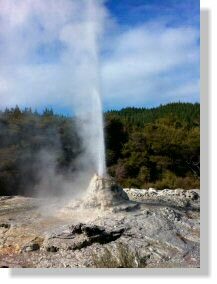 For those with a little more time and looking to explore further, our Rotorua / Taupo / Waitomo Caves two day privately guided tour explores some of New Zealand’s best known natural features, cultural experiences, geothermal activity and a few best kept secrets you won’t find on other tours. Auckland locals and visitors who appreciate fine New Zealand Beer and Wine will get a real kick out of our Boutique Craft Beer Tasting Tour and Wine Tasting Tour. In one afternoon you’ll be introduced to a range of leading craft brew beers in carefully selected pubs (brew bars) offering genuine quality product in a pleasant environment, including some of the most interesting bars Auckland has to offer. Our Wine Tour shows you the best of both white and red wines in some of Auckland City’s wonderful vineyards. If you can’t find something that interests you above please let us know what you are looking for and we will customise a tour for you. We take guided mixed groups and family groups around New Zealand with sightseeing tours from the top of the North Island at Cape Reinga, to bottom of the South Island at Bluff and everything in between. We love showing off our country. Absolute Tours takes in some of New Zealand’s best spots in small comfortable groups. 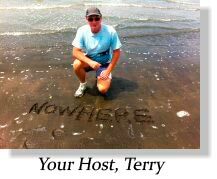 This allows for a more personnel experience in New Zealand’s best locations. In fact a guided tour with Absolute Tours is one of the best things to do in Auckland while you are here. View Bookings Tour successfully added to your Booking. Take in the roads, views and cafes of the beautiful Coromandel Penninsula. Visit the film set for The Lord of the Rings and Hobbiton movies. and tour the famous Waitomo Glowworm Caves. Our most popular introductory 3 hour Auckland City Tour.